Israeli soldiers attacked, on Saturday evening, a Palestinian ambulance crew while they were trying to rescue persons who were injured in a traffic accident near the illegal Gush Etzion colonialist block, south of Bethlehem in the occupied West Bank. 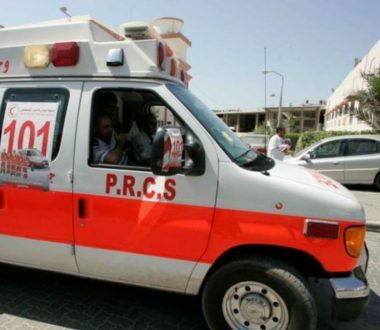 Mohammad Awad, the head of the Emergency Department of the Bethlehem branch of the Palestinian Red Crescent Society (PRCS) said its ambulance rushed to a site of a traffic accident, between a Palestinian car and an Israeli car, near the colony, but the soldiers stopped them near and ordered them not to approach the wounded. The medics insisted on performing their humanitarian duty, before the soldiers assaulted them, wounding one of them, identified as Jamal al-Balboul, 51, who was beaten up and pushed around by the soldiers, who also pointed their guns at the medics. Awad said that this type of behavior by the soldiers is one of the constant Israeli violations against all related international laws that grant protection to medical teams at all times. The Red Crescent said two Palestinians from Hebron, in the southern part of the West Bank, were injured in the traffic accident, and were later moved to a hospital in the city.